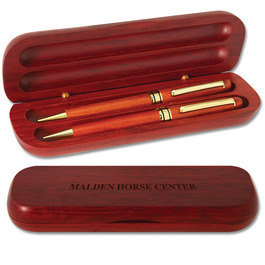 Rosewood Pen and Pencil Set | Hodges Badge Company, Inc.
Case measures 4-1/2" x 3"
Offer a classic pen and pencil set for an award at your next horse show. This beautiful set is made from the distinct rosewood timber that is known for it's rich hues and brown color with darker veining. Customize this award specifically for your horse show with FREE engraved text on each case and the option to add your own design or logo. FOR STOCK DESIGNS: Select a stock design by clicking on View Options or by selecting a stock design number from the drop down box. Once you have selected a design, an image will display on your page. Move your mouse over the design image to enlarge. FOR CUSTOM DESIGNS: For new custom designs that Hodges does not have on file choose the radio button Custom Design and click on the “Upload Your File” button to choose and upload your file. For artwork specifications see the Submit Art link at the bottom of the home page.